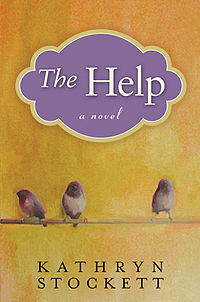 9 of 10: It seems very likely that you’ve seen or heard of The Help; it’s been a huge bestseller. Let me be one more voice in the “This is really a delightful book” crowd. This story about the Civil Rights Era in the South, on a micro-level, is terrifically readable and full of great characters. You’ll laugh, you’ll cry, you’ll go home happy. You know what makes me paranoid? When people talk about how you can’t give any summary of a certain book without spoiling it. Because, what I’m going to say about this book, I don’t feel like is a spoiler. I am going to call that last paragraph “fair warning.” (Also, I just went and read some professional reviews of the book and they all gave plenty of plot summary, so I forge onward guilt free). The story is set in Civil Rights-Era Jackson, Mississippi, which, as you can imagine, is an excellent time and place to be black. Or not. Most of the white people are pretty darn committed to making sure that they stay the ruling race and any attempts by others, black or white, to change that are going to be crushed in a quick and likely cruel way. There are three main characters, each of whom you hear from alternately. One is an older black woman named Aibileen who has been a maid/nanny for a number of families over the course of her life. She’s a little bit quiet, but she’s observant and she has a lot of years of dealing with being a black woman raising a white woman’s children. Minny is Aibileen’s dearest friend, a younger black woman, who is a tremendous cook but has a hard time keeping a job because she can’t often resist the urge to talk back (a trait which is not exactly desired among white families looking for help). And there’s Skeeter, a white girl just graduated from college and still unmarried. Her mother takes that to mean her four-year education was a complete waste. Skeeter’s family had a black maid/nanny for most of her growing up and was extremely close to the woman, but when she returns from college, the nanny is gone and no one will tell her why or where she has gone. Most of Skeeter’s best friends from high school are married and settled down in their hometown, and Skeeter spends a great deal of time with them, but is a little distressed when her closest friend starts really pushing a petition to get white families to put in separate bathrooms for their black help. This event, combined with the mysterious disappearance of her nanny, gets Skeeter thinking about the relationships between blacks and whites, especially when so many white children are raised, primarily, by their black nannies. Could she possibly get some black women to talk about their experiences working for white families? She has dreams of being a writer anyway, and this seems like something that, just maybe, she could start a career with. (I admit, I had to go back and look up all their names – I am terrible with character names, always). There is a lot to like about this book. It is easy to be drawn in by the storyline and the characters and it’s a pretty fast read (I finished the whole thing on my way to Phoenix a few weeks ago). It’s a historical time-period I’ve been really interested in since high school, and I thought the portrayal of the events and the relationships were pretty accurately done. The characters are really well done – they’re all pretty different and easy to tell apart (it is one of my most enormous pet peeves when there are multiple voices that all sound exactly the freaking same and I have to keep checking the chapter heading to see who is even speaking), and they’re all so likable in their own real, sometimes prickly ways. It’s not a perfect book – there were several revelations that I felt like got strung along FAR too long or that when they were finally revealed, I felt were rather anti-climatic. I’m sure there will be people who hate it because it’s popular (are you the same ones who haven’t read Hunger Games yet? ), and some people who just genuinely don’t care for it, but I thought it was definitely worth reading. Plus, you know me. If it’s popular, I want to have read it. Also, is it just me or do you feel especially virtuous when you return a highly-requested book to the library WELL before it is due? Oh, just me? I really liked it, too. I agree that it was very even-handed, which impressed me. And I just loved Minnie to death. She was far and away my favorite character. And yes, I feel extremely virtuous when I return a highly requested book to library early. I had one recently that was a non-renewable, one week loan and I read it over a weekend and returned it on Monday! I felt like I should get a medal (or y'know, a thank you note from the next person in line). Also, my mother recently told me how amazing it was. After reading my friend's review yesterday, I went to the library to request a hold for it…and I am now number 153 in the queue! I will admit, I was surprised that there were that many people ahead of me! K I really just need to request this one already because everyone has loved it and I feel like I'm out of the loop. I'm so glad you liked it! I felt like kind of a populist zombie when I recommended it for your last Tell Me What to Read (like, what, a bestseller? ), but hey, I really liked it, so there it is. The most impressive part to me was that this book overcame three things I normally HATE in books: phonetic dialect, shifting first-person narrative, and tons of hype. The odds were really against me liking it. I'm half-way through his book right now. just finished this, I loved it! I'm just curious about the fact that Kathryn Stockett, a white female, wrote this book. Does it affect your reading of the book to realize that it is a white woman giving voice to black stories? That these black women can only be heard through a white woman? Does that damage the integrity of the message? Also, there are other similar narratives out there written by black women that have not become nearly as famous. Is this because the authors were black? I'm not a black woman, I just think these are some interesting issues when approaching the book (which I haven't read yet). I was also reading an article about this and Kathryn Stockett remarks that she felt a tremendous amount of guilt in assuming this role. Just wanted to get some other opinions and start a conversation. This was a super quick read for me – engaging and interesting. I have to say, it wasn't my favorite book ever… but I can appreciate it. Also – props to you for getting your books back before the due date! I don't think I have ever done that ever in my life. Ever. I thought this was one of the best books I have read in a very long time. (I "read" it on CD while also reading it in print! – something I rarely do) Civil Rights is something I lived through but did not totally comprehend until I was older. Books like this make me understand that era so much more. I laugh because I think of myself as a 'southern girl' but then I realize I am a 'southern girl from Texas' not a real Southern girl from the Real South! funny in so many ways….. I so glad you finally read it and enjoyed it. I think the characters are so well written and the time period is one of my favorites to read about it as well. Great review! I really liked this book, too. It took me through the gamut of emotions but mostly anger. The part I found most ironic? That the ladies league was raising money for children in Africa! My favorite book I've read so far is still "These is My Words". I know you've already read it so I won't try and make you read it again. But for those of you who haven't? What are you waiting for?! Oh heck….my M-in-Law just layed this book on my kitchen table last night (she borrowed from Nancy)….I guess that I am going to have to read it before returning! I loved this book too. I read it early last fall and cannot believe how popular it has become since then (actually, I can belive it because it is such a great read). Just came back to say I finished the book last night. I really liked it except for the naked man in the yard part. That was just kind of annoying because it really wasn't significant to the plot and it threw a disgusting wedge in an otherwise surprisingly clean book. Hmmm. Just finished this one (I know, I know, I'm always behind the times these days), and I liked it quite a bit. Don't know if I would say I loved it or not. It was actually a bit slow for me. And a little bit anti-climatic. I also wondered repeatably (like Cathryn in your comments) about the fact that it was a white woman telling the stories. Ironic. I did think the characters were very real, likeable and hateable and in-between. And since I'm all about character development, I guess that makes it a success :).